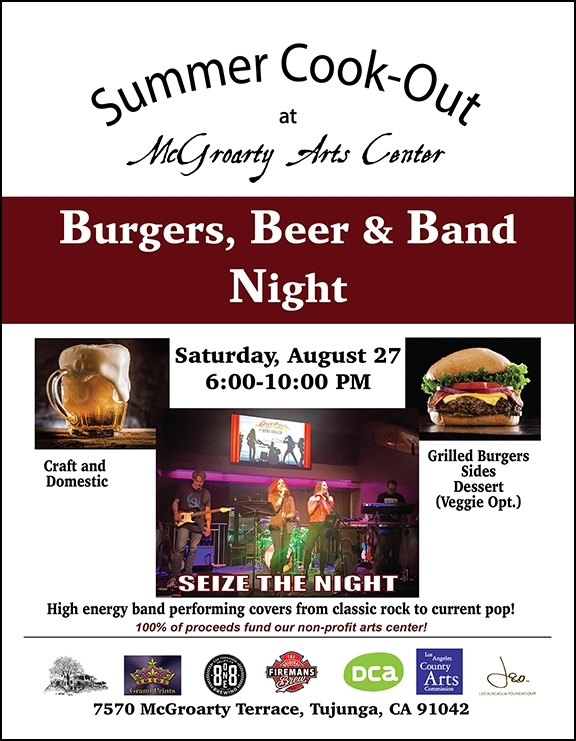 McGroarty Arts Center is hosting a Burgers, Beer, and Band Night on August 27th from 6-10 pm at its location in Tujunga at 7570 McGroarty Terrace. The concert is featuring Seize the Night, a high energy band performing classic rock to modern pop. Bring your family! Come to a summer cook-out under the stars, while hearing the rocking local LA band, Seize the Night,! Enjoy flame grilled burgers with all the fixings, tasty side dishes, and delicious desserts! Craft Beers! There will be vegetarian options too. All the proceeds from the food and beverage sales will go to our non-profit McGroarty Arts Center.